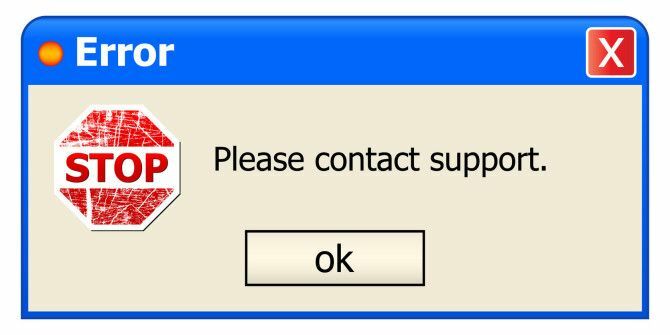 Sometimes, Windows throws a dialog box at you with an error message 10 Silly Windows User Errors That Actually Happened 10 Silly Windows User Errors That Actually Happened Working in tech support is hard. Troubleshooting skills and patience are the corner stones of this craft. But even the most seasoned tech support pros would struggle with these unusual, and occasionally unbelievable, errors. Read More that’s rather long. If you’d like to copy the text How to Copy and Paste Even Faster in Word How to Copy and Paste Even Faster in Word Do you copy and paste in Word all the time? Here's a faster way to get the same result. Read More and search for the error code on Google Access Hidden Android Settings with the Google Settings App Access Hidden Android Settings with the Google Settings App A lot of people don't even know they have the Google Settings app on their phone, but it gives you some great control over your device! Read More , you’re out of luck, as Windows won’t let you. However, you can do it if you download a small portable program 100 Portable Apps for Your USB Stick for Windows and macOS 100 Portable Apps for Your USB Stick for Windows and macOS Portable apps let you take your favorite software anywhere via a flash drive or cloud storage. Here are 100 of them to cover your every need, from games to image editors. Read More called Textify that makes these boxes selectable. It’s not just error boxes that can be selected with this program. Almost any bit of text that appears anywhere on Windows will work. To use the program, just head to this website and download the free .ZIP file. A small box program will open that lets you change the shortcut you’ll use to select with Textify. By default, it’s Shift+Middle Mouse, but if you’re using a laptop, you can change it to any other mouse-related shortcut (Shift+Left-click, Alt+Shift+Right-click, etc). That’s it! Now there’s no text in Windows that you won’t be able to select! And this’ll work in pretty much every single version of Windows without installing anything! Have you ever encountered text that you can’t select in Windows? How did you solve the problem? Let us know in the comments! You can copy anything on the screen bu using the Snipping Tool. Actually, with most, if not all error dialogs, you can just press CTRL+C and it will copy all text in the dialogbox, buttons and all.